Sometimes nothing beats a short dose of audio. Three recently released collections from HarperChildren's Audio just may fill the bill. Fans of Judith Viorst's picture book Alexander and the Terrible, Horrible, No Good Very Bad Day know that things look grim when Alexander wakes up with gum in his hair. 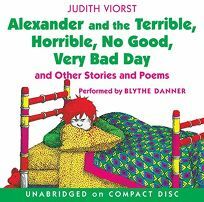 Now listeners can relive Alexander's adventures and hear other selections including Rosie and Michael and The Tenth Good Thing About Barney, all found on Alexander and the Terrible, Horrible, No Good Very Bad Day and Other Stories and Poems by Judith Viorst, read by Blythe Danner.